Artists like painting in oil paint, but how about crude oil – as paint? At an opening on Jan 29 Thu, the big night in Chelsea, at David Krut Projects Gallery at 526 West 26 Street #816 (Tel 255 3094), Jessica Carlisle and Krut introduced British artist, Piers Secunda, 38, and his “Archived Oil”. The show is an extension of Secunda’s unusual path of exploration in art, one of using the medium itself to make the message. Known for using hardened paint in 3d to form variegated and colorful sculptures, his latest inspiration since 2008 is to use crude oil itself to evoke fleeting historical moments in oil exploration and signal their vast impact on world culture. Piers’ work will be on display through Sat February 28, 2015, with hours from Tues to Sat, 10-6pm, attended by Miranda Leighfield and Meghan Allynn Johnson. It is in line with his remarkable previous work making colorful sculptures purely out of hardened paint, casting the component parts and then using industrial fixtures also carved from paint to hold them together. That fifteen years of work extended through abstract “paintings” in various forms and shapes to carved models of a Chinese Wrench and a Clamp formed out of industrial floor paint. Carving the ones six or more layers down is “incredibly hard because you can’t really keep them all in place. His photoworks range from Baku in Azerbaijan, and Spindletop in Texas, to scenes of California, and Colorado. 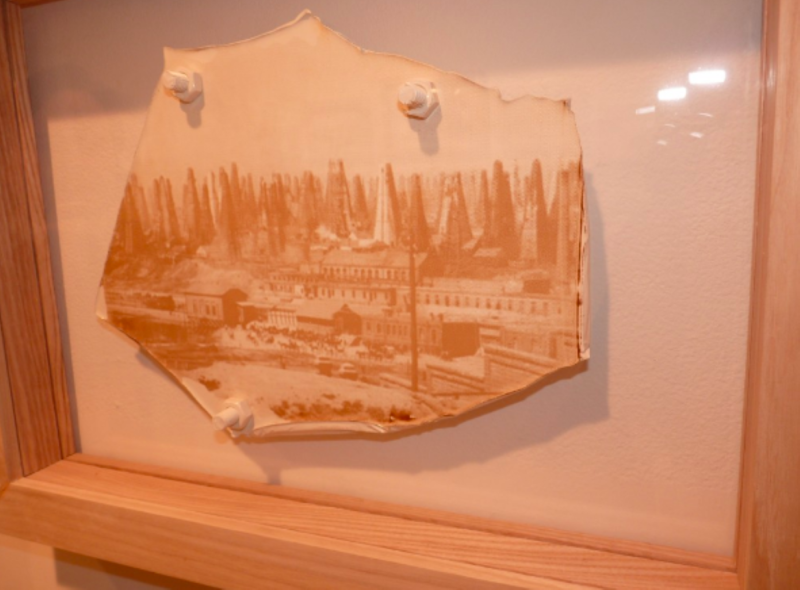 After finding an image of Saudi Arabia’s first successful oil well, Dammam Number 7, Secunda searched for two years for oil from that specific well in order to silkscreen the photograph. The resulting crude oil print tells the story of a moment which had a seismic effect on global economics – the instant the well blew, in 1937, after 13 years of struggle by desperate wildcat prospectors running out of cash and hope on the desert’s sandy griddle. them on the wall and think more about imagery that was appropriate to them. His initial inspiration to merge crude oil with early photos was fueled by his discovery that the invention of kerosene (paraffin) from puddles of crude occurred about the same time as usable photography, most effectively in southern Poland, where Ignacy Lukasiewicz began distilling lamp oil in 1852. “These oil prints started with oil from, and then imagery of the early days of the oil industry, so I’ve covered some of the visuals which relate to it but the subject matter is rolling slowly forwards in time and away from this. These works are starting to gradually build up into an visual archive of the oil age. It just grew that way. Piers Secunda, 38 (his distinguished name sounds like a painter from the Italian Renaissance, but in fact it is derived from a Polish border town now obliterated by war) lives and works in London and New York. He studied painting at the Chelsea College of Art. His recent exhibitions include ‘War Stories’ at the William Holman Gallery, New York, 2014, a group show curated by Anthony Haden-Guest which included Secunda’s bullet hole works, where slabs of imitation wall are pock marked with the exact reliefs of bullet holes he collected from scenes of violent events in the Middle East, including a Taliban attack on a Kabul guesthouse for Indian doctors.